The study adresses the controversy ‘degenerated solid approach’ versus ‘shell theory’. It is shown that both formulations differ only in the kind of discretisation if they are based on the same mechanical assumptions. 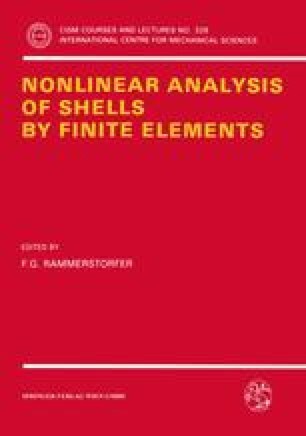 In particular for degenerated shell elements different versions of explicit integration across the thickness are discussed. Among these are the approximation ‘jacobian across the thickness is constant’ proven to be too restrictive and the series expansion of the inverse jacobian which turns out to be unnecessary although it leads to equations of the same order as those of a ‘best first approximation’ of a shell theory. In order to make the differences and identities of the two approaches transparent a notation independent of a specific coordinate system has been utilized; thus transformation between global and local cartesian and curvilinear coordinates are avoided at this stage of the derivation. In addition, the discretization is not yet introduced at this step as it is usually done during the degeneration. For the sake of simplicity only a slight change of the shell thickness is allowed, i.e. the thickness is assumed to be constant.